The U.S. Army‘s 41st Brigade Engineer Battalion uses a specialized technology platform to facilitate a simulation-based training exercise designed to hone soldiers’ tactical and warfighting skills. 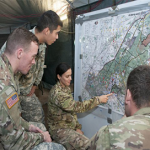 A group of D Company soldiers used the Intelligence Electronic Warfare Tactical Proficiency Trainer system during a Military Intelligence Training Strategy exercise that took place Nov. 6 at Fort Drum in New York, the Army said Tuesday. The training aimed to bring together soldiers who specialize in human, signals and geospatial intelligence in efforts to develop their collaborative skills through physical simulations of intelligence operations. Matt Madson, lead IEWTPT training support specialist, said the system is designed to help military personnel gather and analyze intelligence data as well as prepare reports about their battlefield mission. “IEWTPT gives soldiers an accurate representation of what a real battlefield would look like and an opportunity to practice all aspects of the job they would be called upon to do in theater,” Madson added.